Ever wanted to create your own autobiography or wished you had the life stories of a loved one? This do-it-yourself journal helps record and preserve the experiences and knowledge of a lifetime. Divided into Early, Middle, and Later Years, this keepsake volume contains 201 questions that guide you through the process of keeping memories on subjects such as family and friends, learning and education, work and responsibilities, and the world around you. Created by a grandson and grandfather, The Book of Myself is the perfect way for you, or someone close to you, to remember the turning points and everyday recollections of a lifetime and share them with future generations. Carl E. Marshall was raised in rural Oklahoma and received his Bachelor's and MA in Mathematics from Oklahoma State University and his Doctorate in Statistics from Iowa State. He became a professor of Mathematics at OSU and created the university's graduate program in statistics. He was known by his colleagues as "Mr. Statistics of Oklahoma." 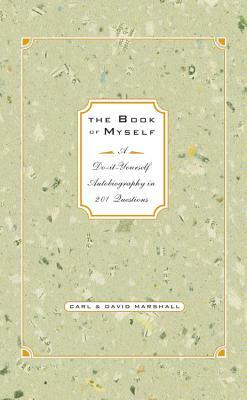 David P. Marshall is the coauthor, with his wife, Kate, of The Book of You: For My Child, with Love; The Book of Us: A Journal of Your Love Story in 150 Questions; What I Love About You; What I Love About You, Mom; The Picture of Me: Who I Am in 221 Questions; and My Life Map: A Journal to Help You Shape Your Future. He lives with his family in northern California.